Will districts be tech ready to administer the nation’s new assessments? The Race to the Top Assessment program is ambitious and has the potential to help make far-reaching changes not only in how students are assessed, but also in how teachers teach and students learn. One important feature shared by both the PARCC and Smarter Balanced assessment systems is that student assessments will be technology-driven. About two-thirds of states currently deliver one or more state tests via technology. For many schools and districts, however, the shift to computer-based assessment for the majority of students will be new. There are compelling advantages to technology-based assessment systems, when compared to current paper-and-pencil approaches. Chief among these advantages is the ability to capture more robust data about student knowledge, skills, and abilities across the full range of content standards through interactive items that can be reliably scored for a low cost. Technology-based assessment can also ensure that results are made available to educators and students in time to intervene and adjust instruction for students who are having difficulty. Additionally, technology-based assessments can be a marked improvement over paper-based tests for ensuring security of both test items and student responses. Indeed, if the aim is to implement better tests with higher college-and career-ready standards, it is sound policy to accelerate the trend toward technology-based assessments. ■ Can school technology investments in etextbooks and digital learning be leveraged for assessment? ■ Will this shift disadvantage students who do not have access to technology outside of school? ■ Will schools be able to accommodate both instructional and assessment needs for technology? ■ Most significantly, will schools be ‘technology-ready’ to administer next generation assessments? These questions — and particularly the last — cannot be answered with a simple yes or no for a number of reasons. First, the nation lacks comprehensive, actionable data on school technology access (this is an issue that the PARCC Consortia are helping to address). Second, even without high-quality data, it is clear there are vast differences among school districts across the country in terms of how they have deployed technology in the past and how they are implementing improvements as an engine of school reform. The ability of the nation’s schools to administer the next generation of assessments hangs in the balance. For the initial year of test implementation, the Consortia have set a highly flexible— and arguably low—bar for the adoption of the technology necessary to run the tests. This was done to accommodate the range of technology currently available in schools and the anticipated access students will have to it. In general, the Consortia have pledged to support nearly every major computer operating system on the market today in a variety of forms (e.g., desktops, laptops, and tablets)—provided that the screen size is sufficient and the system is able to run peripheral devices that may be required. This has required the Consortia to pay special attention to interoperability, security, and accessibility for students with special needs. Moreover, the Consortia have pledged to support legacy technology that exists in schools, some of which is more than a decade old. For instance, schools will be permitted to use desktop computers and laptops that rely on Microsoft Windows XP, even though support for XP (e.g., security patches and updates) will cease on April 9, 2014. A primary reason for this is that more than half of the computers reported in the online PARCC -Smarter Balanced Technology Readiness Tool are running Windows XP. The Readiness Tool, a survey device created by Pearson under a contract with both Consortia, with advice from the State Educational Technology Directors Association, contains data on more than six million devices in use in American schools as of Spring 2013. Requiring those devices to be upgraded or replaced by the 2014-2015 school year would be difficult both financially and politically. ■ The length of the test and testing window. External and Internal Bandwidth: Many districts, particularly those in rural areas, report they lack adequate bandwidth at schools. However, many districts lack the tools and sophistication necessary to determine the extent of the problem because there are many variables that can affect it. Key factors include the age of the district’s or school’s servers, the traffic load on different parts of a district’s network, what devices are used, determining whether operations are wired or wireless, and locating the router in relation to the room(s) where testing will be done. The State Educational Technology Directors Association recommends that schools take advantage of free online broadband speed testing tools to help diagnose these and related issues. (For more information, see this association’s commissioned paper, which has evaluated a number of these tools: www.setda.org/web/guest/schoolspeedtests). Technical Support: As states move to new assessment systems, teachers, administrators, and students must have confidence that the technology will work for the assessments so they can focus on what is important—students demonstrating their knowledge and skills. Preparing the devices and infrastructure for the assessments by installing a secure browser or applications, for example, and testing each to ensure they are in working order, will take time and expertise. And if a computer breaks or a network goes down, districts must have adequate personnel and back-up devices so that disruptions are minimal. Professional Development: All teachers of students in grades that will be assessed, as well as other test administrators, will need to be trained on how the assessment system works, how to ensure students are correctly logged onto the system, and how to proctor the exams. A much more difficult professional development task will be ensuring that teachers employ the very different pedagogies demanded by the Common Core standards. A key element of these pedagogies is seamless integration of technology throughout instruction to solve complex problems and demonstrate mastery in ways similar to the assessments. While this is often not considered a part of technology readiness considerations, there may be no greater threat to readiness than the preparation of teachers to teach the Common Core effectively. 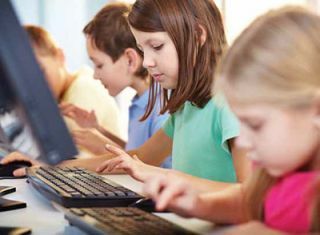 Given the compelling advantages of a technology-based assessment system as compared to paper-and-pencil approaches, schools and districts will need to ensure they are technologically ready for the 2014-2015 school year. More importantly, technology readiness for assessment is not separate from readiness for instruction and learning. In that light, it is not a destination for school districts, but an ongoing process that is vital for 21st-century education. Many districts will be ready when the assessments are administered the first time, and some may bridge their readiness gap with a paper-and-pencil approach for a few more years. Yet as districts move forward, there is no question that it will take a concerted effort and focused leadership to ensure that all K-12 students are provided the opportunity to learn and demonstrate their learning with tools that are already commonplace in both colleges and workplaces across America. Reprinted with permission from the K12 Center (k12center.org). 1. Do you have enough bandwidth to connect to the Internet? The PARCC and Smarter Balance sites have a list of these requirements. 2. Do you have enough bandwidth between your schools and the data center? 3. Do the computing devices for the test have at minimum 10” screens and keyboards? 4. Do you have headphones for every device you are planning to use? 5. Is your state giving all sections of the test on the computer? This will help with your capacity planning. 6. How many students in each grade per building will be taking the test? 7. Will your state or district require that all students from a specific grade take the test on the same day? This will affect how many computing devices you need. 8. Does your district want to test all students within a certain time of the day (e.g., will everyone be tested before lunch)? This will also affect how many computing devices you need. 9. Will your wireless network be able to handle a mass concentration of devices (e.g., up to 30 devices) in any room? This assumes that you do not have enough lab space to give the test only in the lab. 10. Do your students have enough computing skills to ensure that they are using their time wisely during the testing period? This may seem obvious, but the Common Core assessments will involve more mouse and keyboard skills than previous online tests. 11. Will you have enough tech staff available in each building during the testing window to support the test in all locations of the building? You will have to work with your administration to decide how many techs you will need per testing room. 12. Do your teachers have the training to answer basic computing questions on all testing devices? Your teachers may be very familiar with using some devices, but what about the accessories, like headphones, keyboards, or tablets? If the answer is no, that will be two trainings to keep in mind for your teaching staff. Craig Williams is Director of Information Services for School District U-46 in Elgin, IL.